This gives a mere flavour of the original, given the subtleties of Rexel Cumberland coloured pencils and the way in which they blend and bounce off the white paper. It's the kind of image which governments should be issuing. The publisher hopes that " it will inspire readers to spread the message of the joy of cycling and inspire the unconverted to give cycling a go." 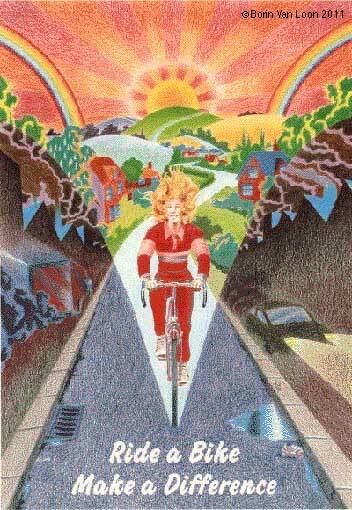 There's a definite nod of the head to the inspirational Hapshash & The Coloured Coat posters by Michael English and Nigel Waymouth in the psychedelic sky; also touches of art deco in the way in which the clouds and smoke billow into the greenery of the faux-fifties rural idyll created by the bow-wave of the ecstatic cyclist. 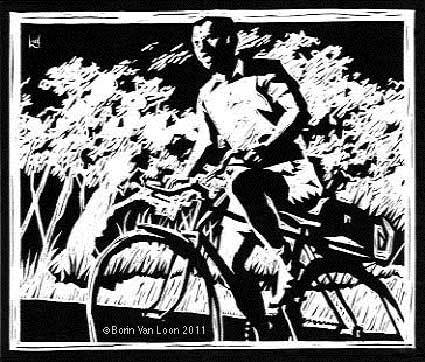 As a complete contrast, my other 'Bike Culture' piece is more expessionistic: a linocut to express the unfettered motion of the freewheeling cyclist on one of those rare, but splendid days when all hills seem to be downhill and those that aren't can be breasted with ease due to a following breeze. This piece was exhibited at The Association of Illustrators Gallery in London.